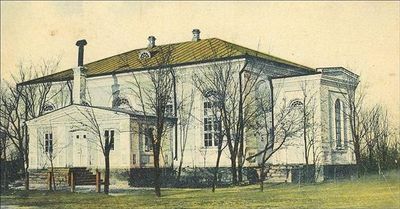 Halbstadt Mennonite Church was originally a part of the Ohrloff-Petershagen Mennonite Church of the Molotschna Mennonite Settlement in South Russia, with one church at Ohrloff and one at Petershagen. The first two elders were Jakob Enns, 1805-1818, and Jakob Fast, 1818-1821. From this, the oldest congregation of the Molotschna, the "pure Flemish" congregation of Lichtenau, with strongly conservative tendencies, separated about 1824 under the leadership of Jakob Warkentin. The remnant of the congregation under the leadership of Elder Bernhard Fast retained its name (Ohrloff-Petershagen) until 1858, when a new church was built in Halbstadt (Neu-Halbstadt) to replace the old one in Petershagen, and the congregation was called Ohrloff-Halbstadt. From 1863, when a third church was built in Neukirch for the benefit of distant members, until 1895, it was known as Ohrloff-Halbstadt-Neukirch. The three elders who had charge of the congregation during this time were Bernhard Fast, 1821-1860, Johann Harder, 1860-1876, and Abram Görz, 1876-1895. In 1860-1884 the con­gregation had in its midst Bernhard Harder, a warmly revivalistic preacher, teacher, and poet, and one of the most important pulpit orators among the Mennonites of Russia, known far be­yond his own congregation. In the course of three decades the three parts of the congregation had grown to such proportions that it was difficult for the single elder, Abram Görz, to give it the necessary spiritual leadership. When he resigned in 1895 the Halbstadt group followed its long-cherished desire for independence, and with the consent of the Molotschna Mennonite Kirchenkonvent it organized as a separate congregation. The choice of elder in that year fell almost unanimously upon Heinrich Unruh of Muntau, who had served them as minister since 1870. He served as elder 20 additional years (to 1915), until his physical weakness prevented his further service in the office. He died in 1927. The local minister, B. Harder, was then given tem­porary charge. In 1918 Abraham Klassen, who had hitherto been a minister of the Gnadenfeld congregation and a teacher in the Halbstadt schools, was chosen elder and served the congregation until 1930. He died in exile. The membership reached its highest point in 1910-19. Since then it decreased by about one third through immigration to Canada and the loss of the members living outside the Molotschna district. In 1926 the total membership was about 1,200, of whom 653 were baptized members. The Halbstadt congregation had been leading in singing among the churches of the Molotschna. In 1919 Heinz Unruh, a son of Elder Heinrich Unruh, a musically very gifted young man, became leader of the church choir. With youthful enthusiasm he reorganized and enlarged the choir and soon ora­torios by Handel, Bach, and Mendelssohn were sung at the Halbstadt church. The choir also made frequent singing tours to other churches of the Molotschna. In 1921 the Halbstadt Mennonite church building became state property, but even now for a while services went on unmolested. After 1927 religious persecution gradually set in, taxes on churches and ministers became increasingly severe, so that at last church activities became almost impossible. But in spite of all difficulties services at the Halbstadt church continued until January 1931, when on New Year's Day the last service was held, and the church was officially closed by the government. The two ministers, Klassen and Harder, were arrested by the local authorities. For several weeks they were imprisoned at Halbstadt and then tried. Harder was sentenced to banishment to Siberia, but fell ill and died one day before the execution of his sentence. Klassen was sentenced to seven years' imprisonment in Melitopol. After three years he was released, but in 1941 was again arrested, and sentenced to Siberia, but died on the way in a freight car. In 1938 the Halbstadt church building was torn down and the bricks used for other buildings. The cemetery across the street from the church with its many beautiful marble monuments was also demolished and the grounds used for other purposes. In its relationship to other congregations of the Molotschna settlement the Halbstadt congregation represented a moderate position and always defended the right of other groups to be independent in doctrine and organization, and had leaders who willingly granted the right of freedom and tolerance to other branches. In the period of confusion attending the withdrawal of the Mennonite Brethren it could therefore preserve a calm, thoughtful position and lend a hand of mediation. As a matter of principle it did not rebaptize persons transferring their membership from other Christian denominations. The fact that Elder H. Unruh, who was always above party spirit and of a very pacific temperament, was the chairman of the Molotschna Mennonite Kirchenkonvent for more than a decade made itself felt, and prepared the way for an understanding between the various branches. (See also Halbstadt, Molotschna, and Ukraine). Hege, Christian and Christian Neff. Mennonitisches Lexikon, 4 vols. Frankfurt & Weierhof: Hege; Karlsruhe: Schneider, 1913-1967: v. II, 235 f.
Klassen, Abraham and Cornelius Krahn. "Halbstadt Mennonite Church (Halbstadt, Molotschna Mennonite Settlement, Zaporizhia Oblast, Ukraine)." Global Anabaptist Mennonite Encyclopedia Online. 1956. Web. 24 Apr 2019. http://gameo.org/index.php?title=Halbstadt_Mennonite_Church_(Halbstadt,_Molotschna_Mennonite_Settlement,_Zaporizhia_Oblast,_Ukraine)&oldid=145379. Klassen, Abraham and Cornelius Krahn. (1956). Halbstadt Mennonite Church (Halbstadt, Molotschna Mennonite Settlement, Zaporizhia Oblast, Ukraine). Global Anabaptist Mennonite Encyclopedia Online. Retrieved 24 April 2019, from http://gameo.org/index.php?title=Halbstadt_Mennonite_Church_(Halbstadt,_Molotschna_Mennonite_Settlement,_Zaporizhia_Oblast,_Ukraine)&oldid=145379. Adapted by permission of Herald Press, Harrisonburg, Virginia, from Mennonite Encyclopedia, Vol. 2, pp. 632-633. All rights reserved.